I was recently sent a free copy of this book by the author’s public relations firm, and offered the opportunity to interview the author for publication on this blog. I read the book and sent off some interview questions, but have been met with a stony silence. I guess my questions rather gave away the fact that I didn’t like Planet Dancing, and here are the reasons why. 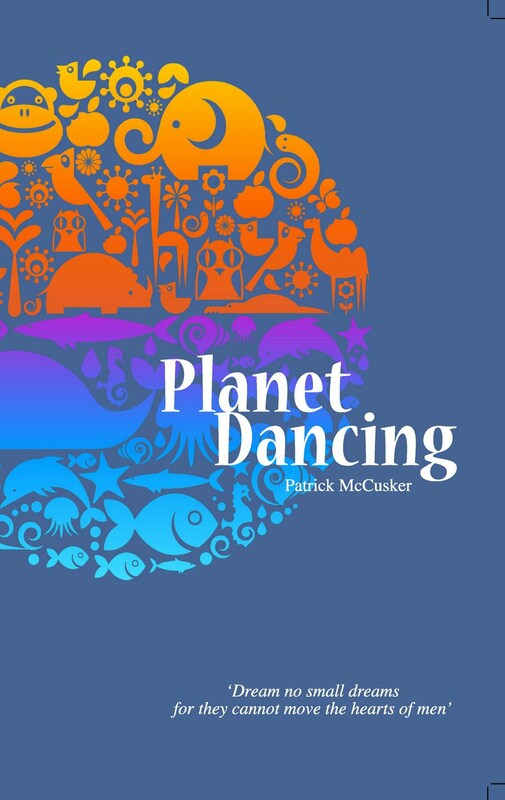 Patrick McCusker is an academic, writer of short stories and producer of radio features. He clearly has a profound love of nature which comes through in his writing, and so, a sincere concern for the planet’s ills, but his remedies lack credibility I’m afraid. This short book is illustrated throughout with colourful sketches, many depicting happy dancing children. 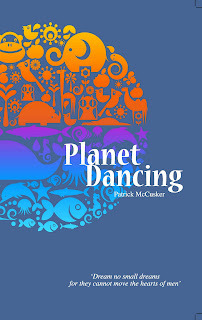 The first section of Planet Dancing is written as a series of short stories or tales, parables even, highlighting various ecological problems, which are moderately entertaining. The second part of the book advances the author’s prescriptions of how to put things right, and it is here that I found the book to be very disappointing. One idea, that children be given ‘nature names’ rather like native north American peoples, is well meaning, but to then claim that this will inevitably lead to children, when full grown adults, respecting nature more, is a huge leap of faith in my opinion. Indeed, the author puts great faith in children to protect our environment, and has seemingly largely given up on adults being able to change their ways. McCusker further pursues this theme with his suggestion that a ‘children’s nature reserve’ be set up by collecting small amounts of money from the children of the world. He also suggests that the great religions of the world should set up a second reserve. Even if these ideas came to pass, and there are many practical hurdles to overcome, it would not have any significant impact on species depletion worldwide. Strangely, there is no mention in this book of man-made climate change, which is surely the biggest threat to all living things on the planet, and we get some insight into the reason for this, in the author’s attitude to multi-national corporations. He suggests that people like Bill Gates could be persuaded to contribute large amounts of cash to alleviate world poverty, and goes further with his recommendation that corporations be ‘induced financially’ to provide work in factories, on meagre wages, in poor countries, to get people off the land. Incredibly, there is no acknowledgement that these same corporations are the root cause of the ecological crisis. In one astonishing passage, McCusker advocates that ‘professional bribe fixers’ be employed to utilise the endemic corruption in many poor countries. Until we got to these later chapters of Planet Dancing, especially looking at the illustrations of animals and children, I was put in mind of a children’s book. It may well have been a better idea to write a purely children’s book given the author’s faith in children saving the planet, and target them directly. As it stands, this book, well-meaning though it is, is shallow and somewhat naïve. McCusker’s philosophy seems to be a combination of deep ecology and eco-capitalism, which he advances in this book. At best, this type of thinking is pretty irrelevant, when it comes to providing answers to the ecological crisis, and at worst, down-right dangerously complacent. The only way to save the planet is to radically transform the way we organise our economies along the lines of an eco-socialist approach, but you’ll find none of that here. Interesting...do you know that I am working on a translation of Daniel Tanuro's 'L'impossible capitalisme vert'? 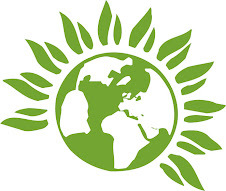 The title of the English edition is to be 'The Delusion of Green Capitalism'.....I introduced it at a Fringe meeting at GP Conference last week. I didn't but thanks for letting me know, perhaps you let us know when it is published?